Home » xiv » IF PIARA BHANIARA GOES TO JAIL I WILL BE PROVED WRONG. IF PIARA BHANIARA GOES TO JAIL I WILL BE PROVED WRONG. I am seeing news headlines that Piara Bhaniara the cheap saint goes to jail and that he has been convicted today the May 10, 2013 by an Ambala court. It really baffles me. For me it is unbelievable because I know the force behind Bhaniara. 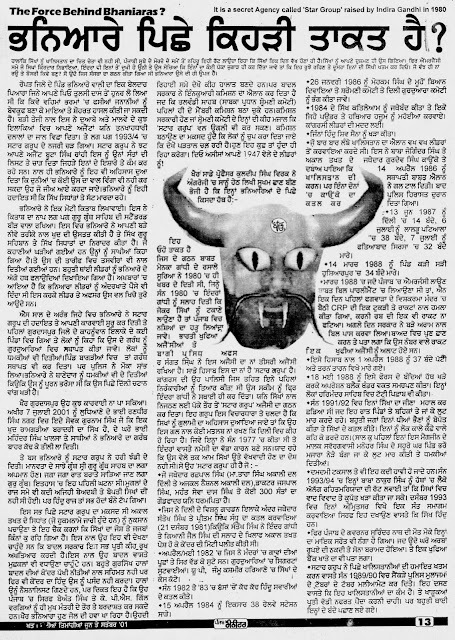 Here is an article in Punjabi which I wrote about this dirty man in Dec. 2001. Though the chances are remote, notwithstanding the judgement if it finally happens it will be a sort of damage control exercise by Govt of India. They might sacrifice their tool just to restore the faiths of Sikhs in judiciary. With the equittal of Sajjan Kumar of Delhi the Govt is on receiving end as far as its credibility of just Govt is concerned. Click to enlarge the text image. 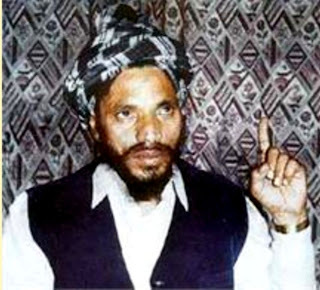 Baba Bhaniara born in 1958, is a Dalit holy man the spiritual leader of a breakaway Sikh sect, Piara Singh Bhaniara, based in Dhamiana village in Ropar, Punjab. He grew up in a modest family, his father Tulsi Ram, a mason, was a caretaker of two mazaars. After his father’s death, Bhaniara took over the mazaars and proclaimed himself a baba (a spiritually advanced person). Bhaniara was known a healer for work and used to leave food for wild animals in forests. Senior Congress Party leader Buta Singh had visited Bhaniara several times between 1985 and 1995 for healing of his wife Manjit Kaur, who was suffering from several problems of the heart, kidney, skin and lungs. Buta Singh later disassociated himself from Bhaniara. Bhaniara wrote a book Bhavsagar Granth, describing his miracles, and released it in 2001. This offended the Sikhs, who complained that Bhaniara was equating himself with the Sikh gurus. An organization Khalsa Action Committee was formed headed by Charanjit Singh Channi, which disrupted a religious congregation at the home of one of Bhaniara's followers in Ludhiana in 2001. Bhaniara's book was snatched and damaged. Following this, Baba's followers were accused of burning the copies of Guru Granth Sahib, the Sikh holy book. No evidence to support the accusation was found. 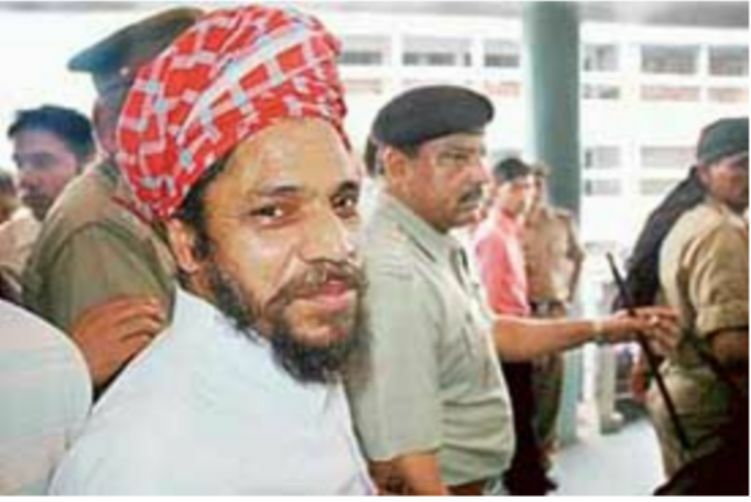 Bhaniara was arrested in October 2001. His book was banned by the government, and several copies of it were burned. An agitation was called by several Sikh youth organizations including Dal Khalsa and a building and a center of the baba were demolished. 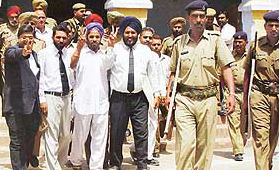 In 2003, a man named Gopal Singh attempted to stab Bhaniara, when he was in Ambala to appear in the court in connection with his alleged involvement with the alleged burning of the copies of Guru Granth Sahib. 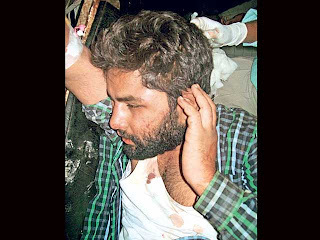 A member of Babbar Khalsa, Gurdeep Singh Rana was arrested for trying to assassinate Bhaniara using a bomb in January 2005. PAYAL (LUDHIANA): Waiting for the return of his son from a visit to the Golden Temple, Gurjit Singh, a well-established businessman and a landlord, initially refused to acknowledge a call from the incharge of police chowki in Rauni village, near Ludhiana, that informed him about his son’s involvement in a murderous attack on Baba Piara Singh Bhaniara. “It may be a case of mistaken identity, please cross check your information,” Gurjit Singh told the cops and banged the phone. But a few minutes later his phone rang again with one of his friend informing him about the arrest of his son. “There is something missing in the chain,” he reiterated, adding that it was “absolutely unbelievable” that his son could get into such a “messy affair”. Given the reputation and the “good conduct” and “business dealings” of 24-year-old Harvinder Singh, who is among the three arrested for attack on the Baba, not only his family but entire village has found the news a big shock. A business and management degree holder, Harvinder had left his home on October 25 for a visit to Amritsar. “He called us in the morning to inform that he is on the way back to home but before he could reach, phone calls about his involvement reached home,” his father Gurjit Singh told daily Post. Harvinder’s family said none of them had ever talked or followed Baba. “Not even when Baba was in limelight in 2001, Harvinder ever talked about him or shown interest for or against the Baba and his activities,” family members said. Senior Congress leader Buta Singh, who has been accused by Punjab Chief Minister Parkash Singh Badal of laying the foundation stone of a “dera” of Baba Piara Singh Bhaniara, asserted today that he had nothing to do with the ideology of the controversial preacher. Khalsa Panchayat blocked the Chandigarh-Ambala highway in protest against the burning of Birs at Zirakpur on Saturday. ‘’The blockade, coinciding with the ‘Punjab bandh’ call given by the Panthak Morcha, was successful, ‘’The Khalsa Panchayat convener, Mr Rajinder Singh, claimed here today. The inter-state buses were not seen on the city roads during the blockade time as the protesters did not allow these to enter or leave the city. Vehicles were seen lining-up in long queues at all major entry and exit points of the city especially on the Chandigarh-Ambala road. The blockade did not affect the city internally, but entry into the city from Punjab and Delhi side was completely affected between 9.30 a.m. and 1 p.m., The Superintendent of Police (City), Mr Baldev Singh, told Chandigarh Tribune. The ‘seal city’ call was given by the panchayat and the committee represented by 18 gurdwaras and 12 Sikh religious organisations and was opposed by the Shiromani Akali Dal (SAD) local unit president Gurpartap Singh Riar-led co-ordination committee representing remaining 23 gurdwaras. The major protest in the city was held at the railway station crossing where hundreds of the panchayat activists tried to stop traffic coming from Panchkula between 9.30 a.m. to 1 p.m., but police diverted traffic to allow entry and exit from the city, the SP (City) said. The daily commuters were left stranded on the outskirts of the city putting them to great inconvenience, a daily commuter from Banur, Mr Arunjeev Singh Walia, said. The panchayat claimed that eight main entry points were blocked at Zirakpur, Chandigarh Railway Station Chowk, Mullanpur, Maloya, Balongi, Jagatpura, Sohana and Phase II in Mohali completely cutting off the two cities. The police said the protest remained peaceful. The protesters, however, allowed schoolchildren, patients, essential services and fire brigade vehicles to cross over. Despite that, Mr S.K. Nair from Panchkula complained that his relative could not reach PGI in time due to the traffic blockade. The panchayat claimed that two girls’ and all boys’ colleges and a number of schools in the city remained closed today on the call of the Sikh bodies. The convener of the panchayat, Mr Ranjinder Singh, said the Chandigarh Mayor, Ms Harjinder Kaur, was amongst those who were present with the protesters at Zirakpur. The Sarb Hind Shiromani Akali Dal (SHSAD) activist and Shiromani Gurdwara Prabandhak Committee (SGPC) member, Mr Amrider Singh, participated in their individual capacities in the protest. The protesters moved, to put up blockades, from Sector 34 gurdwara in Chandigarh and Gurdwara Amb Sahib in SAS Nagar reciting Gurbani and slogans against Baba Piara Singh Bhaniar whose effigies were burnt at different places. The panchayat disassociated itself from any political party saying they had nothing to do with the Panthak Morcha which had given a Punjab bandh call today. The protesters were demanding that the government should take steps to prevent sacrilegious attempts and culprits should be punished. They also demanded those defiling religious books should be given death penalty and special courts should be set up to dispose of these cases in three months. The panchayat warned that if immediate action was not taken, they would be forced to take harsher measures. The convener of the panchayat told Chandigarh Tribune that to create an atmosphere against these acts, nine in the recent past, a seminar would be called with participation from all religions. The local SAD president, Mr Riar, lashed out at his rivals saying instead of putting the people to inconvenience on the issue they should have concentrated on better security of gurdwaras so that ‘’evil’’ elements did not get opportunity to engage in destructive acts. He said the calls for Punjab bandh and the sealing off the Chandigarh and Mohali were given keeping an eye on elections and to defame the Punjab Chief Minister, Mr Parkash Singh Badal. The SHSAD general secretary, Mr Prem Singh Chandumajra, the Punjab State Communist Party of India, the local unit of the BJP and the Anglican Church of India, Missionary Diocese of Chandigarh had condemned the burning of ‘Birs’. While the CPI said the events posed danger to the secular fabric of the country and might result in caste wars and criticised Mr Badal for failure to handle the situation, Mr Chandumajra sought to implicate those near Mr Badal saying they had been followers of Baba Piara Singh. Demanding action against perpetrators of these acts, the BJP said it was a handiwork of anti-national forces. The church authorities while condemning the alleged burning of Guru Granth Sahib said religious books of all religions should be respected. Attacks on Sikhs in the US were also criticised. Mr Chandumajra said the ‘’success’’ of bandh was an indication of all-round ‘’failures’’ of Mr Badal. MULLANPUR-GARIBDAS: The market at Mullanpur-Garibdas remained deserted as the shopkeepers joined the bandh call against the alleged burning of “Birs” and kept the shutters down. Several vehicles were seen lined up at the Mullanpur - Chandigarh barrier and local residents were forced to use alternate routes to reach Chandigarh. Shops at Naya Gaon village also remained closed. The residents later took out a procession to the Sector 34 Gurdwara. However, no blockade was put up on the Naya Gaon barrier. People used link roads of the villages falling in Punjab to enter the city. A large number of Punjab villagers who come to the city for their jobs and other works either reached the city before the start of dharna or preferred to remain indoors. Milk supply to the city, however, remained unaffected as the bandh started after 9 am and the milk delivery work was almost over by that time. SAS NAGAR: Roads were blocked and almost all shops remained closed here today in protest against incidents of sacrilege at various places in Punjab and the state government’s alleged failure to take action against the culprits. The call for the statewide bandh was given by the Sarab Hind Youth Akali Dal, the All-India Sikh Students Federation, the Youth Akali Dal (Amritsar) and the Dal Khalsa. The call was endorsed by SHSAD President Gurcharan Singh Tohra. The police had been deployed at various places to prevent any untoward incidents. Its personnel were seen diverting traffic. Queues of vehicles formed on roads and vehicle drivers were seen trying to find alternative routes to reach their destinations. Almost all shops were closed for most of the day. Some private schools at SAS Nagar also responded to the Bandh call. Protesters blocked traffic at various points, including Sohana, the Balongi barrier, the Phase IX, Industrial Area, Ambwala Chowk and PCL Chowk here. They sat in dharna on the road, disrupting traffic. At certain points slogans were raised against the Badal government and Baba Piara Singh Bhaniara. At Balongi, children from the Guru Ram Asra Trust here squatted on the road. Many of them were holding placards asking the Badal government to “wake up” and demanding action against those responsible for the sacrilege. The protesters, including women, were chanting “Satnam Waheguru”. At Sohana there was a total bandh and the road going towards Chandigarh was blocked by agitated protesters. Some women sat on a durrie on the road reading from the ‘Gutka”. Many protesters stopped vehicles even before these could reach the scene of the dharna. Mr Manjit Singh Sethia, a municipal councillor from SAS Nagar, said the dharna had not been organised by any political party but was a protest by all who condemned the incidents of sacrilege. The blocking of the road at Ambwala Chowk here began around 11.30 a.m. instead of the scheduled 9.30 a.m. and was not as effective as at other points. A municipal councillor, Mr Manmohan Singh, Lang, said there was some confusion as the protesters had earlier been asked to go to Sohana. In the Phase IX Industrial Area a shamiana was put up and the road was blocked by parking vehicles. 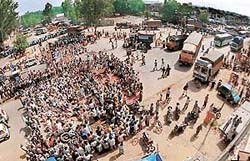 The protesters raised slogans against the state government’s failure to take action against those behind the sacrilege. ZIRAKPUR: Traffic on the busy Chandigarh-Ambala National Highway No. 22 came to a standstill for over five hours today as irate people from nearby villages blocked the road to protest against the burning of Bir by followers of Baba Pyara Singh Bhaniara in various parts of the state. On a call of the Sarab Hind Shiromani Akali Dal and other Sikh bodies, a complete bandh was also witnessed till 2 p.m. by shopkeepers of Zirakpur, Dera Bassi, Lalru and surrounding townships of Banur and Rajpura. They lifted the shutters of their shops in the afternoon. All exit and entry points to Zirakpur, Dera Bassi and Lalru townships were blocked by the protesters. They parked tractor-trailors, autorickshaws, trucks, canters and buses across the roads. More than 350 men and women from the Sector 34 gurdwara also joined the agitation under the leadership of Ms Harjinder Kaur, Mayor, Chandigarh, and demanded that cases under Section 302 of the Indian Penal Code should be registered against the accused. Various schools, colleges and other educational institutions also remained closed in the subdivision. Those who had to join their offices in Chandigarh and Panchkula were delayed for two to three hours. Thousands of passengers who had to catch the train from Ambala and Chandigarh railway stations were left stranded on the railway station because of the delay. The long-route buses coming from Shimla and heading towards Delhi and those on the reverse route opted for the Panchkula-Barwala-Saha road to rejoin the highway ahead at Ambala. After being informed about the bandh, a large number of commuters opted for various kutcha link roads passing through villages to rejoin the highway at Ambala. Hundreds of commuters remained stranded on the way to their respective destinations. Commuters of Zirakpur and surrounding areas opted for the Zirakpur-Panchkula road and then took the Sahajadpur link road to reach Ambala. Commuters from Dera Bassi opted for the Kurli-Jharmari link road to reach Dera Bassi. Passengers also preferred the Dera Bassi-Joli link road to reach Ambala. The traffic was diverted from Tribune Chowk, Transport Chowk and Airport Chowk by the Chandigarh Police. The road users were also seen arguing with the cops on duty. The agitators in Lalru burnt the effigy of Baba Pyara Singh on the highway. Apart from the agitators, the Dera Bassi police had deployed a number of cops to seal all link and main roads on the Haryana border. Though the bandh ended peacefully and no untoward incident was reported in this part of the state, the police had a tough time in controlling the crowds.